Angry Birds may have lost its first place grip in the iTunes App Store, but it still reigns supreme on the NOOK. And starting today, for a limited time, Angry Birds addicts with a NOOK Color can visit any Barnes & Noble retail location to unlock the free playable character, Mighty Eagle. The Mighty Eagle has already been seen in iOS versions of the game, but it's the first appearance on the NOOK app. It also marks the first offering from Angry Birds "Magic Places", a partnered campaign with Rovio that lets NOOK Color users add new characters and elements to their Angry Birds gameplay by physically going to the nearest B&N location and downloading the geo-freebie. If you want the Mighty Eagle, then just head over to a B&N bookstore and connect to their free Wi-Fi to unlock the character at no cost. 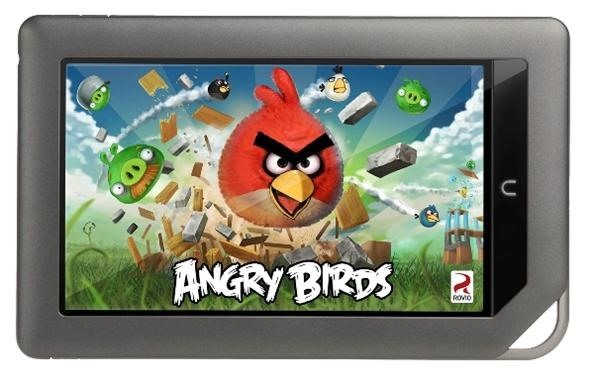 While playing Angry Birds on NOOK Color in-store, you can use the Mighty Eagle to overcome challenging levels and earn Eagle Score points. It's a great character to have if you're stuck on a tough level. But it seems it's only available for play in stores, so if you have trouble beating a difficult level, you have to head over to a store location. Ingenious marketing? Maybe.